I love fried rice. It’s so accommodating. Whatever leftovers you happen to have (and I mean anything), it’s an easy matter of cutting things down to size and quickly sautéing them all with some rice. Simple, nutritious, and fridge-cleaning, it could hardly get better. For this version, I used the leftovers from the steak tacos I made previously. The various vegetables used to garnish the tacos – red onion, scallion, cilantro, bell pepper – were also saved, all jumbled together in a bag. They were already sliced, but a quick chop brought them down to bite-size, which I prefer in fried rice. A fast and hot turn in a pan with some olive oil charred the edges nicely, and softened the crunch before cold leftover brown rice was added. Letting the rice sit for a minute or so gave some of the rice that wonderfully crisp texture around the edges, though you can skip that if you like. The steak and some chopped scallion tops were added just before removing the pan from the flame, and residual heat warmed the meat perfectly without cooking it further. I added some hot sauce to the pan, mostly on a whim, but also served additional salsa verde, leftover from the tacos, at the table. I would write a recipe for this, but the nature of the dish is so impromptu and variable that it seems unnecessary. It’s really more about technique than ingredient. All you really need is to have your rice cold (ideally, but even this is not requisite), your vegetables and other add-ins chopped and ready to go, and a hot fire under a pan large enough to really toss things around. 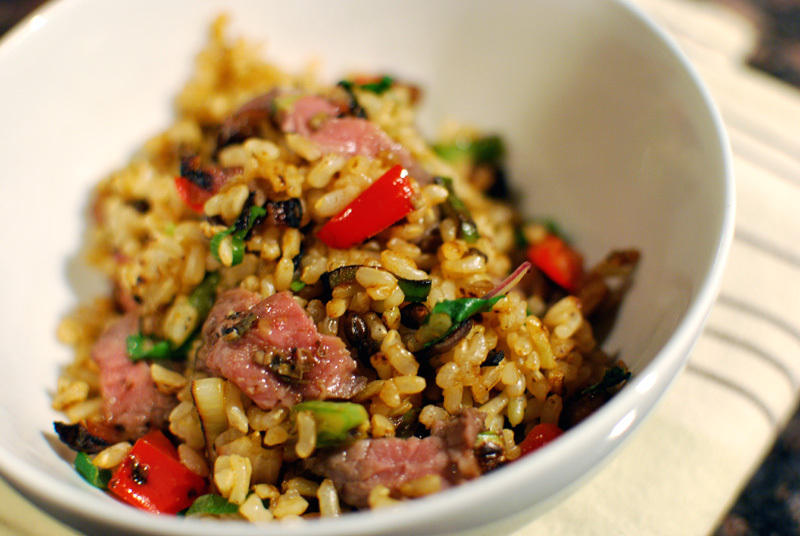 Add a touch of oil, then anything that needs to be cooked, then rice, then stir in anything that needs only be warmed. Serve. Easy as pie. Who needs a recipe?